Natural Alpine trees are sometimes called Charley Brown Christmas trees. 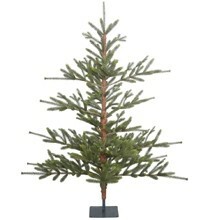 The 2 foot table Alpine trees come unlit and a square metal stand is also included. 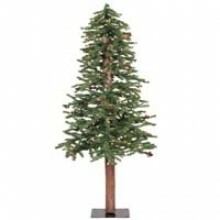 This unique 6 foot Alpine tree is lite with mini lights and comes with a faux bark tree trunk and a strong square metal base. This small 3 foot Swiss village Alpine Tree comes with no lights. It has a faux bark tree trunk with long thin wire branches.